For the past two months, our discussion of fascia centered on the basics - what it is, where it is, and why it is important followed by another article on how to maintain healthy fascia. This month’s article is the grand finale of sorts, the information all of you with screaming fascia want to know. Where are the most injured areas of fascia, how can you prevent injuries to the fascia, and how do you treat dysfunctional fascia? Some of the best examples of fascia in the body is the plantar fascia, which makes up the majority of the arch at the bottom of your foot. Chances are even if you have never been diagnosed with plantar fascitis, if you firmly press into this fascia, it will likely be uncomfortable. This fascia, just like the iliotibial tract or IT band on the outside of your thigh, are the two most common areas of fascia in your body to become overly tight and painful. There is also a lumbodorsal fascia on each side of your low back that connects the bottom of your rib cage to your pelvis, which can sometimes also be an area of pain and tightness (especially after a moving day) from overuse. 1) Prep tissue adequately before using it vigorously. Example: do a functional warm-up prior to plyometric training, or before that once a year golf outing. 2) Maintain fascia length throughout the year to ensure you have enough fascial length for that mighty 60 yard touchdown pass you throw in the annual post - Thanksgiving dinner football game. 3) Train with appropriate intensity. Do not increase your distance, speed, or weight by greater than 10% each week (and only increase 1 variable each week) to stay injury-free. 4) Show your fascia love early and often. Functional warm-up prior to activity, stretching after and ice as needed if myofascial soreness creeps in after activity. So what if it is too late? You already have over-stressed and/or over-stretched the fascia, sustained a muscle strain, or contused the myofascial when an opponent landed on the back of your leg. 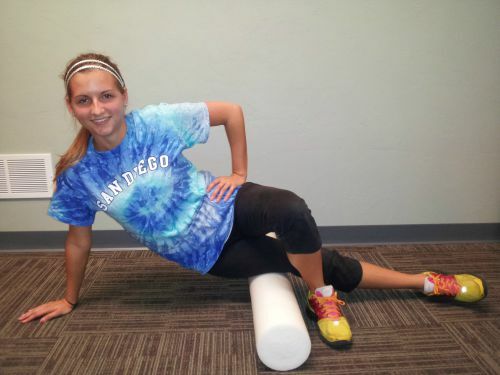 How do you care for injured fascia? Let’s first take a look at what injured fascia looks like at a microscopic level. Injured collagen tends to have additional cross-links, contributing to tightness and spasm in the area and reducing fascial length. Blood flow may be interrupted forcing cellular waste products to accumulate in the region, and the area will exhibit an inflammatory response as a part of the body’s normal healing process. There may also be broken cross links, accompanied by microscopic tears in muscle fibers nearby (keep in mind that fascia is typically NEVER injured in isolation - there is always a muscle, joint, tendon, and perhaps ligaments in the area also affected). 1) Apply ice to the area for 15 minutes up to once per hour, with the area elevated if swelling is moderate to severe. An ACE wrap may be applied to help control swelling between icing sessions. Use crutches or a cane as needed to off-load tissue if walking increases your pain. 2) Begin gentle stretching to myofascial tissue and gentle movements through the local joint, keeping these motions pain-free to begin reduce the local spasm and tightness. After several days of gentle stretching if the tight areas still appear to be in spasm, using a foam roll or theracane to assist depending on the area you have injured. 3) Sub-maximal isometric strengthening may be the first type of strengthening tolerated in the area once the acute injury process has started to subside. 4) Once your pain with daily activities (non-work-out activities) is gone, you can begin gentle walking, swimming, biking, etc that will ease you back into your work-out routine, keeping in mind the 10% rule discussed above. 5) If your injury has lasted more than one week with continued pain despite your best efforts, or if the injury is moderate to severe in nature, do seek a professional evaluation from a physical therapist or athletic trainer, as more intense and specific treatments may be needed to help restore myofascial tissue and/or joint motion and limb strength back to its normal state. A trained medical professional will perform soft tissue mobilization or myofascial release to encourage tissue remodeling after injury, which will reduce the pain of muscle and fascial spasm and help restore normal tissue length. Specific joint mobilizations and muscle activation and later strengthening exercises can help address the likely reason why you injured the area, and thus help prevent re-injury once you return to your normal activities. 6) Remember that if you cannot apply weight or move the area at all without pain, seek medical attention immediately to rule out a fractured and/or dislocated bone or complete muscle and/or tendon rupture.